Just a quick introduction - Hi everyone! I'm Stacey, a forty-something married mom who is waist deep in her jigsaw puzzle addiction and loving every minute of it! I started a blog to track my progress on this giant puzzle, and have ended up continuing to blog about all my jigsaw puzzles even though this Disney beauty was finished in April of 2017. It's nice to meet you! Soon after deciding I wanted to give a giant puzzle a try Ravensburger announced they were coming out with a new World's Largest and it would be frames from 10 Disney movies - YESSSS! Cartoon puzzles are my favorite, and I have such good memories of watching Disney movies both as a child, and with my own children. Perfect timing with the perfect puzzle! 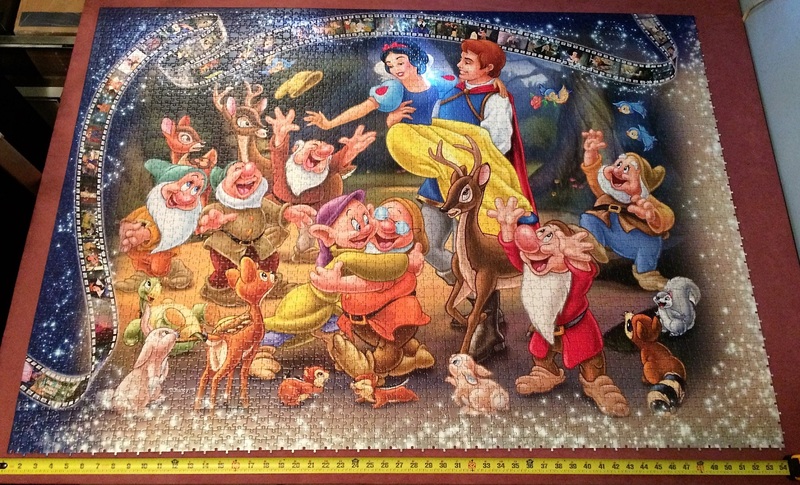 The Snow White section took 20 days for me to complete, which is better than I had hoped. 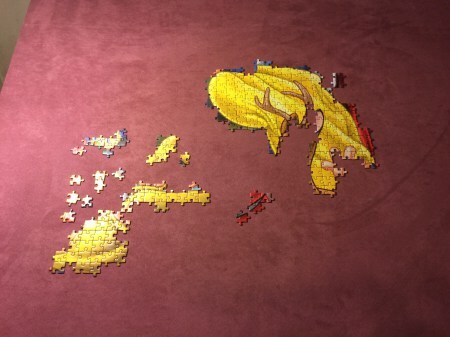 I figured it would take me much longer, but I went into that zone that puzzlers know where time seems to disappear and the only thing is the puzzle and placing that next piece. The film strips that run along 1 or 2 edges of each section were so much fun to assemble; they were my favorite part. The "twinklies" (the starbursts around the edges, as I have named them) were the most tedious, but luckily there aren't too many in each section. It's funny how it just looks like a regular sized puzzle, but if you look at the tape measure at the bottom, it's 54 inches across! It's been over a year since I completed this section, and I actually am missing it a little bit. I got better at taking pictures as I went along, so this isn't my finest photography, apologies. Stay tuned for the next section, Cinderella - coming soon! **If you're someone who says I didn't complete a 40,320 piece puzzle because I didn't mix the bags together, I completely understand your point of view and you are absolutely entitled to your opinion. I am also entitled to my own opinion and am proud as heck of my accomplishment! !